There is practically no trace of Dennard's pianistic talent. The man appeared on half-a-dozen sessions with Hampton but was left very few solo space except for the 1956 Jazztone sessions with LT and Pettiford. 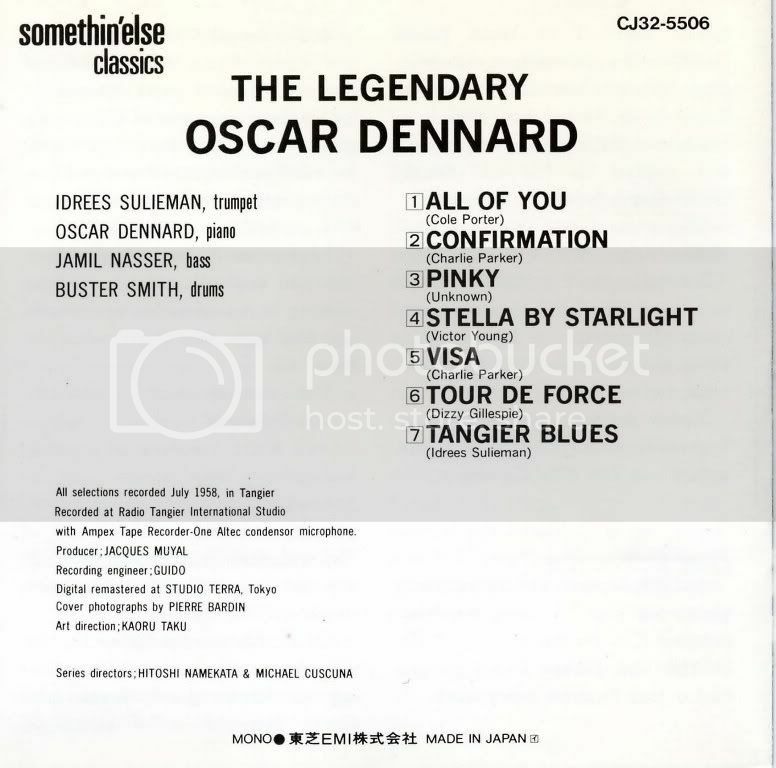 Dennard recorded a trio date that is mentioned in the Tom Lord discography. It is a January 9, 1956 session for an obscure label with Joe Benjamin on bass and Osie Johnson on drums. This remains unissued. 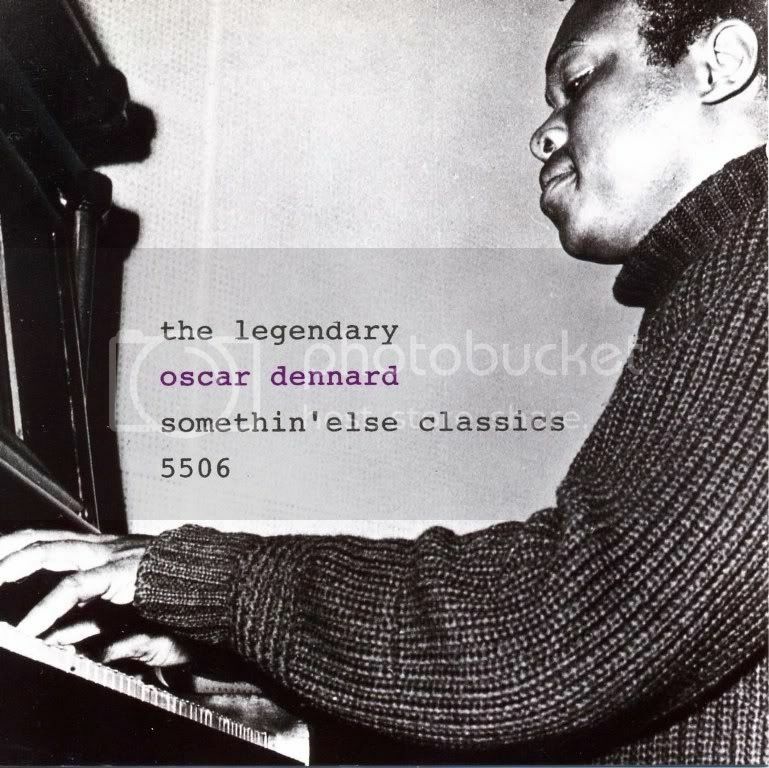 The Japanese Somethin'Else CD 'The Legendary Oscard Dennard' at least provided an opportunity to listen to the man. But it was barely in circulation. The session was recorded in Tangier by local jazz fans at the Radio Tangier International Studio. 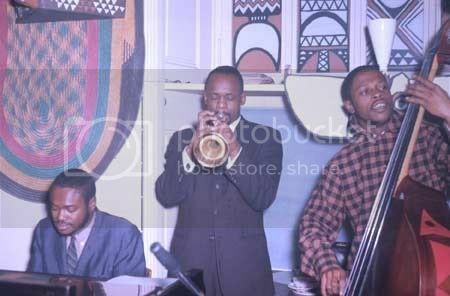 The recording date is listed as July 1958 but in 1958 Dennard was still in the USA playing and recording with Hampton. Dennard traveled to Europe, probably at the very beginning of 1959, with trumpet player Idrees Sulieman, Jamil Nasser on bass and Buster Smith on drums. They were in Paris at the start of that year. Pretty sure the recording date of the Somethin'Else CD is off by one year and should be July 1959. The sound is a bit muffled, the piano is untuned but the four musicians had talent and it shows. The liner notes mention the informal recording session was held in a small studio with an old piano. More bad luck and one more unheard Dennard session is a French radio broadcast (Carrefour du Jazz) that had Lester Young playing with Dennard, Jamil Nasser and Buster Smith (the full rhythm section of the Dennard/Sulieman group) plus fellow pianist Rene Urtreger and guitarist Jimmy Gourley. The broadcast produced a 'D.B. Blues' that remains unissued. It was recorded in Paris on March 11, 1959 just two days before Lester Young flew back to New York to die. The liner notes to the Somethin'Else CD by Jacques Muyal mentions that the Dennard/Sulieman quartet played for a couple of months at the Casino in Tangiers. Muyal adds that the group also played in Tunisia, Marseille and St.Gallen (Switzerland) and arrived in Egypt. There Dennard was stricken with typhoid fever and died in 1960. He was buried in Cairo at Zan Eldin cemetery. I believe Dennard was born in 1928 . I know he spent time in Memphis , though I don't know whether he was born there . He also spent time in Des Moines before joining Lionel Hampton in the mid-50's . The unissued 1956 trio session is listed as being recorded for Henson . Does anyone have any information on this label ? Dennard also appears on a 1959 Jubilee album called " Blow Man Blow " by tenor player Jesse Powell . Would anyone who has heard this care to comment ? Very interesting pianist that never reached his limits due to his untimely death. There are some sessions with Hampton, but I doubt they feature him in any way. That trio sessions is listed Bruynincky as unissued, too - would be a miracle if the tapes turned up somewhere. The best feature besides that Somethin' Else CD is probably the small group sessions with Hamp (Lucky Thompson, Oscar Pettiford, Gus Johnson, Ray Copeland, Jimmy Cleveland also on board) - these need to be reissued! All I know about him comes from the liner of the Tangier CD .... thanks for the photo! Dennard is also included on A.K. Salim's "Blues Suite" on Savoy - a terrific record that was reissued on cd, although it is not in print at present. He and Eddie Costa are both credited, and I have never found a breakdown as to which pianist performed on which tunes, although I don't think there can be much doubt since both were singular stylists. Dennard's contributions to the Hampton material on Jazztone are very attractive. I think he had a unique and very interesting voice on the keys. Those Jazztone sessions would make a nice double-cd set. I have that material from cassette recordings, but would love to track down the originals. The Jazztones are quite hard to come by and those I have come across have been priced beyond my means. I have heard the material on the Audio Fidelity label Hampton recording credited to Dennard, it is not worthwhile - Dennard is scarcely audible. There are a couple of more Hamp recordings on which Dennard is credited, which I have not bothered to run down given my disappointment with the Audiophile label record. I also have heard a tape of 2 titles that were said to have been recorded in 1953 at Quincy Jones' apartment in NYC - "Invitation" and "Tenderly". The notes on the cassette were for 5 titles, but only 2 were contained on the cassette. I do not know if any more of the session exists or if it was a mistake in the notes for the cassettes. The recording quality is not especially good, but the music is of great interest, especially given the scarcity of any recordings with Dennard on them. I am very fond of the "Legendary" cd. Sulieman and Nasser make substantial contributions and there is a nice vibe to the session. Dennard is excellent. I felt very fortunate to find a copy of that cd (thank you Mr Tanno!). No kidding! I've wondered about the discographical details, but I could swear I hear 2 different pianists. Maybe that's because I want to hear them! I think that I hear Dennard on a couple of the tracks, but my ear is far from infallible. Regardless, it's a great record, but I'd love to know for certain. Thanks for your input. I just spent a very enjoyable hour reviewing this album to try to figure what I heard before. The adventerous harmonies in the comping on "Full Moon" and "The Sultan" sound like Dennard to me. Trouble is, I am not sufficiently familiar with Costa's work to eliminate him. I do believe that only Costa solos on the album. Does anyone have access to Ruppli's Savoy discography? I wonder what it has to say on the subject. The back of the cd shows two dates, one with Costa, Joe Wilder, and Philly Joe Jones (Sept 26), the other with Dennard, Paul Cohen, and Granville Hogan (Oct 6), but does not note which tunes were recorded on which date. Curiously, the reproduction of the album cover on the insert does not credit Dennard, Jones, or Joe Wilder. Nat Adderley, c; Paul Cohen, or/and Joe Wilder, tp; Buster Cooper, tb; Phil Woods, as; Seldon Powell, ts, fl; Sahib Shihab, bs; Eddie Costa, or Oscar Dennard, p; George Duvivier, b; Philly Joe Jones, or Wilbur Hogan, dr; A.K.Salim, arr, cond. a. (pace Rüppli, there is no aural evidence for a vibraphone on any selection: this agrees with the original sleeve note. b. Confusing Granville T Hogan and Wilbur Hogan is not unknown, but here the preference must be for Wilbur, firstly because he is mentioned on the original sleeve, and secondly because Dennard and he were both with Lionel Hampton at the time. c. It is tempting to divide the selections between a Costa/Jones and a Dennard/Hogan rhythm team. I cannot distinguish aurally between Philly Joe Jones and Wilbur Hogan, nor between selections with one trumpet, and those with two. The only piano solos (on Blu-shout and Joybox) are both definitely Costa. As I am familiar with Costa's style I will listen to my tape of Blues Suite and see if I can pick out Dennard . Thanks Pete for this discographical tidbit . Maybe that's because I want to hear them! That may be one reason for this. The other is that what Ruppli says in his discography is not very clear (don't have it at hand). And the back of the Denon/Savoy CD is a bit of a mess (as usual, I'm afraid). Strictly on aural evidence I'd say both solos are definitely Costa's and I'm pretty sure the comping is his. PS I'm working on a discography of Costa, btw. That Costa is the only piano soloist in Blues Suite was my thought, too ... I can distinguish between the two drummers and will have a listen again with this in mind. Yep. This came out roughly on the same week I decided to start working on mine . There are a few things missing there, but it's been really useful to have something like it online. Like any discographer I'm building upon what's already available and, with luck, will improve it. 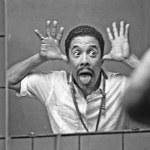 Sometime around 1980 Sadik Hakim played me an open-reel tape of Dennard playing solo at a house party. I don't remember the date, but presumably by the sound perhaps from the early fifties. I first met Idrees Sulieman at Sadik's apartment around the same time and believe the tape came from him. Jamil Nasser also has it and played it on WKCR some years ago. The tape has two tunes - Boplicity and Round Midnight. I remember Boplicity as played very smoothly in block chords perhaps in emulation of the Birth of the Cool band. He had a beautiful sound. I'm dying to hear this tape again. Jamil had some kind of conspiracy theory about Dennard's death that I never understood. Something about their tour in Tangiers and the CIA?? I asked Joe Wilder a few days ago about Oscar Dennard and the name didn't ring a bell. Select the "looking back" button on the right and then go for "Africana", third from the bottom - some great pics in other chapters, too! The capture says they're from 1962 (and taken by the host of the place called "Africana" and decorated accordingly). Anyone know where I can get a copy or download of the Legendary CD? I know this is a real long shot, but what the hell. Dennard can be seen and heard here on youtube with the Hampton band in Belgium 1958. (This is apparently from a DVD entitled ‘Lionel Hampton: Live in 1958’ issued by Jazz Icons). Dennard is featured on “I Found a New Baby” which unfortunately is a something of a "dixieland" novelty - still, you can get an idea of his musicianship. More interesting, although no visual, are the following from a group of 10 discs(?) from a Stuttgart concert from 1958 now on youtube, presumably by the same band - personnel is not listed but it is certainly Dennard. In particular hear him on “Midnite” (small group) and “Confirmation”.